"Great Halloween cake! You'll need a new kitty litter box, box liner and litter scoop as props to get the full effect with this cake!" Prepare cake mixes and bake according to package directions (any size pan). Prepare pudding according to package directions and chill until ready to assemble. Crumble sandwich cookies in small batches in a food processor, scraping often. Set aside all but 1/4 cup. To the 1/4 cup add a few drops of green food coloring and mix. When cakes are cooled to room temperature, crumble them into a large bowl. Toss with 1/2 of the remaining cookie crumbs, and the chilled pudding. You probably won't need all of the pudding, you want the cake to be just moist, not soggy. Line kitty litter box with the kitty litter liner. Put cake mixture into box. Put half of the unwrapped tootsie rolls in a microwave safe dish and heat until softened. Shape the ends so that they are no longer blunt, and curve the tootsie rolls slightly. Bury tootsie rolls randomly in the cake and sprinkle with half of the remaining cookie crumbs. Sprinkle a small amount of the green colored cookie crumbs lightly over the top. Heat 3 or 4 of the tootsie rolls in the microwave until almost melted. Scrape them on top of the cake and sprinkle lightly with some of the green cookie crumbs. Heat the remaining tootsie rolls until pliable and shape as before. Spread all but one randomly over top of cake mixture. Sprinkle with any remaining cookie crumbs. 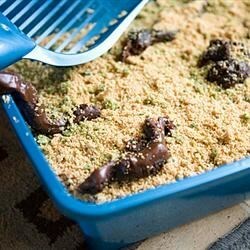 Hang the remaining tootsie roll over side of litter box and sprinkle with a few green cookie crumbs. Serve with the pooper scooper for a gross Halloween dessert. A perfect cake for April Fools' Day or Halloween. I have found when doing this cake that the plastic liner makes it tough to scoop so I do not use the liner for the recipe.